Which of the Disney Magic Kingdom Hotels should you choose for your Walt Disney World vacation? The Magic Kingdom hotels are all Disney deluxe hotels and all offer a great location and excellent accommodation and facilities. They are all very different though and you need to know which one will suit your family best. Here is a guide to the Magic Kingdom Hotels which includes details about the different themes, rooms, facilities and rates. The Grand Floridian is Disney’s flagship hotel. The best of the best. Well in theory anyway. It is a beautiful resort, but you will pay handsomely for the privilege of staying here. We think that there are better options and this is not our first choice of Disney World Magic Kingdom Hotel. The location of the Grand Floridian is excellent. It is right on the shores of the Seven Seas Lagoon and within minutes to Magic Kingdom. Many of the 900 rooms in the hotel have a view of Cinderella’s Castle. The design is reminiscent of a turn of the century elegant seaside resort. If you have ever seen the Hotel del Coronado in San Diego then you will know exactly what the exterior design of this magnificent hotel is based on. Step into the lobby and you cannot fail to be impressed. The lobby is 5 stories high and beautifully decorated and furnished in a Victorian style. Whilst the lobby is imposing it is a very relaxed place. You will feel at home whether you are in a dinner jacket or a Goofy shirt and hat. The standard guest rooms at The Grand Floridian are a comfortable 440 square feet in size and most will sleep up to 5 guests. The recreational facilities are excellent too. The main pool is on the shores of Seven Seas Lagoon and has water falls, water slides and a zero entry beach access. There are tennis courts, a fitness facility, jogging track and a full service spa. The location of The Grand Floridian really can’t be beaten. 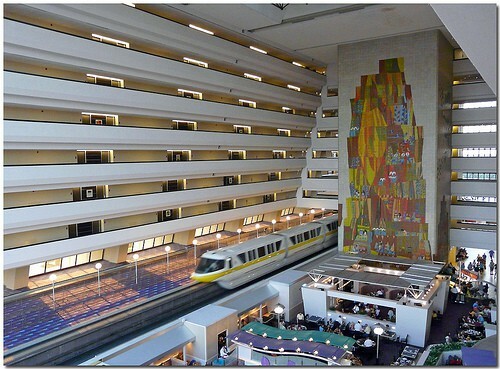 This is one of the Disney monorail hotels and access to the Magic Kingdom is a breeze. You can also easily travel to the Transport and Ticket Center on the monorail and change to another monorail which takes you to Epcot. There is also access to Magic Kingdom by resort boat. Bus transportation takes you to the other parks and Downtown Disney. There are plenty of excellent dining venues at The Grand Floridian Hotel. From the adults only restaurant Victoria and Albert’s to the character dining at 1900 Park Fare there is something for everyone. Rack rates for the Disney Grand Floridian Resort and Spa start at around $500 a night and upwards. Offers are sometimes available. If you are looking for a Disney hotel in a very convenient location with large rooms with excellent contemporary furnishings then the Contemporary Resort should be on your wish list. 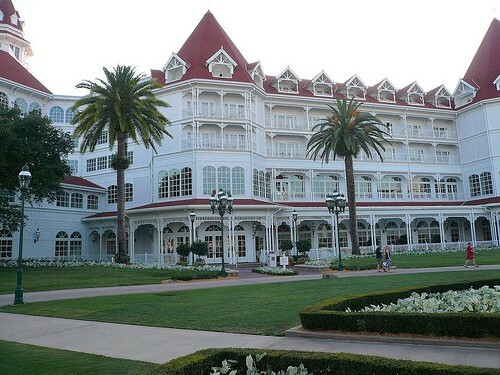 This is one of the original Walt Disney World hotels and the location is excellent. Like the Grand Floridian it is on the Disney monorail system so you can easily reach Magic Kingdom and Epcot. The monorail station could not be closer – it is in the lobby! The Contemporary Resort has a very distinctive A Frame construction. The rooms are smaller than the Grand Floridian but are still a very reasonable 400 square feet. Many of the rooms have a view of The Magic Kingdom. The furnishings in the rooms are very contemporary. Some may feel that the lack of Disney touches is unfortunate, whilst for others the absence of lots of Disney theming may be an advantage! Each sleeps up to 5 guests. Whatever type of dining experience you are looking for you will find it at Disney’s Contemporary Resort. One of the best restaurants is California Grill which is located on the 11th floor and gives one of the best views of Magic Kingdom anywhere in the World. If you are looking for a more casual experience then the very popular Chef Mickeys is located just next to the lobby. There swimming pool at The Contemporary is rather disappointing as it is not particularly themed or exciting. 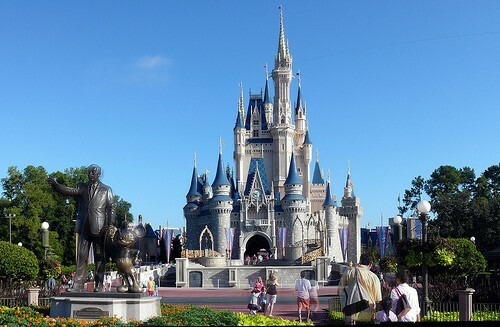 If you are looking for a great swimming pool you would be better of choosing one of the other Magic Kingdom Hotels. Room rates start at around $410 per night and upwards for the Contemporary Hotel in 2012. Be transported to the South Seas as you enter this beautifully decorated and landscaped Disney deluxe hotel. The location is great as it is another of the Disney World monorail hotels. Just step out of the lobby and catch the monorail. Within minutes you will be in Magic Kingdom. This hotel has some of the largest standard hotel rooms of any Disney World hotel resort ranging from 410 to 476 square feet. Some have views of Magic Kingdom. The one disadvantage is that not all of the rooms have balconies so if that is important to you then make sure you request one at the time of booking. As with all requests remember that although Disney will do their best, they are not guaranteed. Room rates at the Disney Polynesian Resort start at around $405 and upwards for 2012. Step into the lobby and you feel as though you have entered a tropical paradise. Lush landscaping is found both inside and outside the resort. The hotel pool is very nicely themed with water slides and waterfalls. It is relatively small though so it can get very crowded. 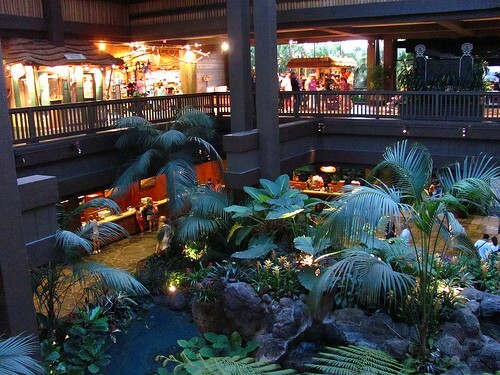 The restaurant choices are good and the hotel is of course home to the very popular Polynesian Luau Dinner Show. If you are looking for a complete change of pace then consider Disney’s Wilderness Lodge Resort as a place to stay for your vacation. It really does feel as though it is a million miles away from the hustle and bustle of the theme parks, but they are still on your doorstep. Whilst the Wilderness Lodge is not quite as convenient as the other Magic Kingdom hotels because it is not on the monorail system it is still easily accessible to all the parks by either boat or bus transportation. 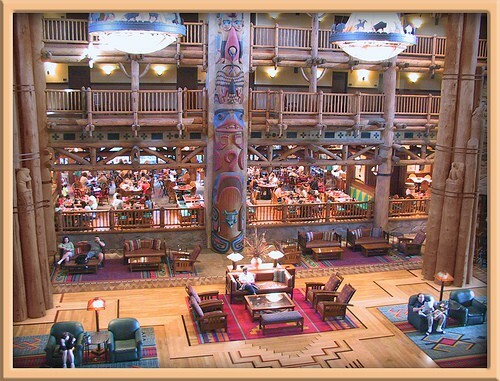 The Wilderness Lodge hotel takes it’s inspiration from the Old Faithful Lodge in Yellowstone National Park. You really do feel as though you have stepped into one of the great National Park lodges. The theming is just beautiful and very relaxing. The Lodge has 728 rooms. They are very nicely furnished but they are the smallest of all the deluxe resorts at an average of 340 square feet for a standard room. So if you are looking for the most space in a Disney resort room then this is not the best choice for you. The Villas at Wilderness Lodge offer larger accommodation which can be a great idea for families. Studios, one and two bedroom villas are available. Rates for a standard room start at $265 for 2012 but most are in the $300 to $400 a night range. There are some good dining choices at Wilderness Lodge particularly Artist Point. This fine dining restaurant serves traditional American style food such as it’s signature Cedar Plank Roasted Pacific King Salmon. The main swimming pool at The Wilderness Lodge Resort actually starts as a bubbling geyser inside the lobby. The pool is beautifully themed and it has a water slide to keep the kids happy. Transportation is not as easy as from the other Magic Kingdom resorts but it is still very convenient. The boat trip to Magic Kingdom is short but very relaxing, and there are buses available to the other parks and Downtown Disney. Whichever of the Disney Magic Kingdom Hotels that you choose you will be sure to have a magical experience. They are all of a very high standard in a wonderful location. The only thing you have to decide upon is which one of these amazing Disney Magic Kingdom Hotels to choose.